I’m currently on a flight from Japan back to California after a productive two weeks with our Men’s National Team. My first season on staff is now complete, allowing me the opportunity to reflect back and share some of our experiences. LEARNING was the theme of the summer for all of us. Building an efficient staff, a good team dynamic, and good volleyball players requires all of us to be great learners. Back in October we qualified for the Grand Champions Cup by winning our zone tournament. Getting to Japan was an important accomplishment on multiple levels. First, we were able to compete against five of the best teams in the world. GCC was a round robin tournament with Brazil, Russia, USA, Italy, Japan and Iran participating. This experience is invaluable for both our players and our coaching staff. We are a young team that needs to take advantage of every opportunity to compete. Knowing that we needed as much time as possible with our guys we decided to arrive in Japan a week early. The Japan Volleyball Association was kind enough to let us stay at their Olympic Training Center (this is an amazing facility). This allowed us to practice, lift, and watch film with our guys before the tournament started. You get good at what you emphasize. Japan knows that they need to dig in order to stay competitive. Defense is not just a skill but a mindset in Japan. They are building their system around the abilities of their players. We ended up playing a solid match in a great environment, winning 3-1. Following the match we immediately started fine-tuning our scouting report for Brazil who we played the next day. With five matches in 6 days we came in to the tournament with scouting reports already created. The tricky part is the opponent rosters aren’t available until the day of the match (you can change the roster before each match). Because of this you have to adjust and fine-tune the existing reports. This proved to be more time consuming than I originally anticipated. I had spent the previous six weeks studying film and analyzing data. However, once you get to the tournament there’s always more scouting work to be done. Having gone through this experience as a staff was invaluable. Brazil is arguably the strongest volleyball country in the world. They have a deep talent pool, good coaches and a professional league that allows their players to remain in Brazil while making a living playing volleyball. However, the United States has held it’s own vs. Brazil which is pretty amazing considering the talent pool discrepancy. Once again we went in to this match well prepared. The first set was a battle. We ended up losing 31-29. The second set was no different. We were up for most of the set but couldn’t close the deal. We ended up losing 0-3. The good news is our young team is battling with one of the best teams in the world. Our setter is a junior in college. Their setter has Olympic medals. At some point in the quad we will start winning those close sets against the best teams. Up next was Italy. Italy is consistently one of the best teams in the world. Their opposite is arguably the best opposite in the world. He has a cannon of an arm and can crush his serve. We had a good plan going in to that match and were able to engage in a battle. Team USA ends up winning that match 15-13 in the 5th set. Having our young guys experience these types of matches is priceless. It was a great win. Once again we immediately started working on scouting with Iran up next. Iran is a good volleyball team that is rapidly gaining respect around the volleyball world. It was actually a pretty interesting dynamic considering our match was being played in parallel with the nuclear negotiations between the USA and Iran. The issues between the two countries were on the front page of every newspaper in Japan. All of the teams were staying at the same hotel, eating in the same room, and sharing elevator rides throughout the week. On the eve of the Iran vs. USA match I introduced myself to the Iranian assistant coach. He was an incredibly nice guy. He was telling me a little bit about their culture and their people’s desire to live normal lives. Long story short, both teams showed an enormous amount of courtesy and respect for one another. I think it felt good for both teams to be above the ego-driven political drama that exists in our world. The following day we go in to the match with the opportunity to guarantee a medal in the tournament. One of Iran’s strengths is their depth. The sub like crazy and their subs are good. After losing the first set 29-27 we settled in and started playing well. We won set 2 and 3 due to more consistent serving pressure. Set 4 is when things got interesting. We were in control of the match with a 23-20 lead when we started missing some serves. We allowed Iran to stay in the game which resulted in a huge momentum shift. Iran ended up coming back and winning the fourth set. Game five was a battle but the momentum that Iran generated in game 4 carried them to an 18-16 5th set victory. This was one of those losses that keeps you up at night as a coach. These are big time learning moments for our team. Winning is fickle. When you have a team down, even the smallest of ebbs can change things in a hurry. It’s not enough to only play one point at a time. You have to play one point at a time for long periods of time. Being able to focus for an entire match is hard. Our minds want to get big picture. We start thinking about winning or other things that can influence performance. Teaching our athletes to have a narrow focus for a longer period of time is a top priority moving forward. Things didn’t get any easier from that point on. Our last match of the tournament was against Russia. Russia won Gold in the London Olympic games. 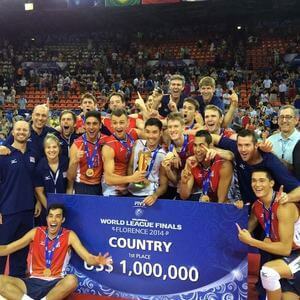 They also won the 2013 World League Tournament. They are THE best team in the world right now. Once again we found ourselves in a first set battle. We ended up losing 29-27 in the first set. Our young team is battling the best team in the world. It was fun to watch. However, as the match progressed Russia’s serving pressure broke us down. We ended up losing 0-3. Winning is fickle! The margins are so unbelievably thin at this level. After a week of high-level volleyball, 2 points vs. Iran was the difference between a bronze medal and 5th place. While we would have loved to be standing on the podium, the lessons learned are exactly what our young team needs. We have an amazing group of guys on this team. They work hard, they like being coached, and most of all they are becoming better learners. Expect greatness by 2016! Mike thank you for a great article. The most valuable lesson is that you have to learn valuable lessons. Great article Mike! I love hearing about your team’s experiences as well as what your learning priorities are going forward.